I'm not sure how auto tune works but in Ohm Studio every VST plugin can have a MIDI In. Right click on the plugin in the Mixer and choose "add track for..."
Then in the Track Header, click on the Arm Record button and the plugin should receive incoming MIDI events, for exemple from your MIDI keyboard. About the Pre / Post fader mode, I think it's already there, unless I misunderstood you. And "on the fly" time stretching when changing the project tempo is currently not possible because the time stretch technology we're using is not a "real time" algorithm. If we wanted to use this same algorithm in order to get that kind of on the fly time stretch (like in Ableton Live), then that would mean that a new audio file would be created and uploaded for each Audio Pattern each time the project tempo changes. 1. with automation, selecting all and dragging left and right compresses and expands it, could this be possible with midi segments. It makes things much easier in case where say a part if laid but it needs to be double the tempo, normally its a click and drag so say half the size it was. There's actually a way to do that... although not as convenient as the method you describe I must say. First select the Automation Points you want to "stretch", then in the "Action" menu choose "Event position" then choose "Speed" in the pop up window. With the Time stretch I sorta meant that, to be able to pull it up on a piece of audio and create a new bit, as a temp solution. Eventually I guess ya have options like purge unused audio for say owners of tracks etc, or creators. Can always have a WARNING! this will delete unused audio local and remotely. I see when a piece is copied that it doesn't create new and uses whole part from before, so is ohm not making edits or these stored too as new? I ask because it's great copying whole complete record but sometimes edits are only say 1 bar of a 16 bar record, and if they are being copied, stored in mem then this is a bit wasteful. I by habbit grab a bit, add some fx on it then bounce it as a new piece of audio to a new track, grab the audio put it where i want it then delete the track it created when I bounced to new track. I'm happy doing this but might be better for most to say right click bounce segment then when it's bounced it sticks to the pointer until placed somewhere. Also then then maybe same option again but timestretch like when version could be there too, so someone can bounce say a 4 bar segment right clicking then also time stretch it too, this in itself allows for new creative things too. It would be better when copying a segment say whilst we hold ALT and drag with mouse to just copy what's shown and not the whole recorded part. Maybe ohm reuses but if it don't then this woudl save on disk and memory usage. I'm sure I see like edits in the cache folder but named different. When you duplicate an Audio Pattern with ALT+Drag and Ctrl+C / Ctrl+V, Ohm Studio does not create a new audio file. When you Clone a project, Ohm Studio does not create any new audio file. On the other hand, when you use Bounce to new Audio Track, Ohm Studio "records" the output of a plug-in into a new audio file, both locally and on the server. We'd like to have a "purge" function one day, at least on the server side to free up disk space. One last thing, you know a few been mentioning audio setup being a problem for n00bs, well maybe first off we need Normal and Expert Mode, so in normal it can say add Mono Input, Add Stereo Input, Add Multi Channel Input. Then have some simple tips like 1 or 1/2 is typically Mic for most and 3/4 Line In. Maybe hover tips for mono stereo and multi channel saying something like Mono is typically used for Mic, Bass or Guitar Inputs, Stereo is typically used for Synthesizers or L and R inputs, Multichannel is typically used for multiple inputs like used on Drums. Ok we'll try to improve the Audio Setup screen so that it is more "noob friendly". As for sharing your Audio Setup with other users, that would be very complicated actually. It would be easier to use a screen sharing software like Skype. Then when clicked they start a new, bring up public list, bring up my projects list, share window to invite, get link to mixdown and so on. This will help LOADS new comers. Also a little check box, show this at start up so people can still have old view with out splash on the right. 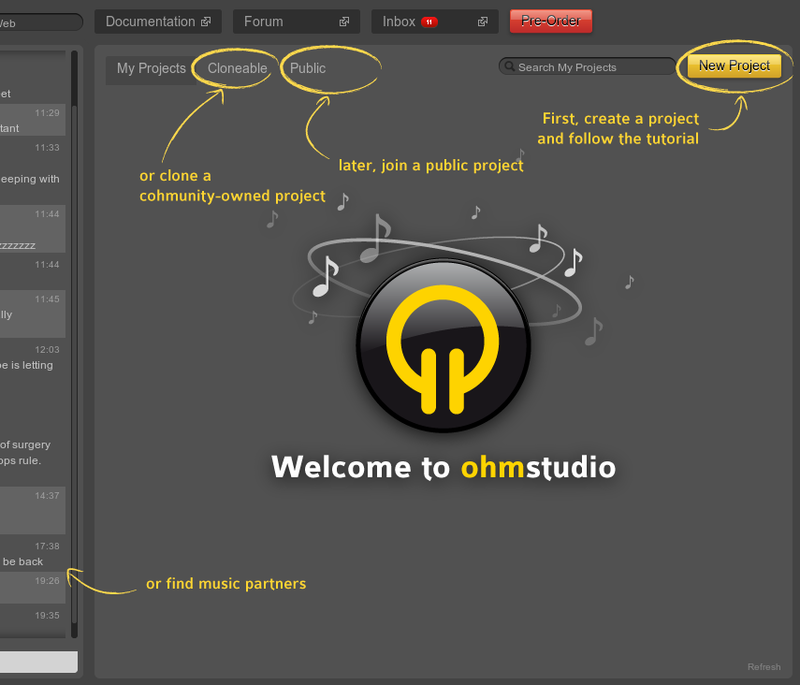 When people join Ohm Studio for the first time, their Dashboard actually looks like that. -option to set the spacebar as "play, return to start position automatically" instead "play, pause"
And of course, loop record with overdub, replace, stack takes options, please!!!!!! Something crossed my mind while using OhmStudio. I think users should be able to have a "share this plugin" button, that would download the vst plugin to the other users computer. I am not sure if there are legalities involved in this, but if it was freeware that is ok to freely distribute, it would make a lot of sense to automatically download this to the other machine to sync the project. Obviously, payware wouldn't be like this, but it would be a great way to sync up and save time. Not sure if it would be possible to have it load into memory realtime, but having it download would definitely be a nice start. -IMO the modular view is a REAL mess for just simple outputs features like send and group, and unfortunaly actually it's the only way to set outs. for users who don't like the modular view, please add a simple dropdown menu on the mixer to choose send and direct out destinations. -possibility to open gui plugins of a rack directly in the sequencer view (even for plugins without track). That sounds like a good idea but that would be quite complicated both from a technical and legal perspective. Maybe one day it will be possible to rent 3rd party plugin for a certain amount of time in some sort of online store, but not anytime soon! This one should be fixed soon! Actually there's already a dry-wet parameter available for all FX in the audio engine but unfortunately it is well hidden inside the Plugin Inspector at the moment. Dear OHM Force, it would be possible to have anonymous login please.For privacy work before anything else.Thank you very much! What would you call an anonymous login? Ok. Thanks for answer. Before anything else, let me say that english is not my native languaje, so maybe that's why I couldn't explain exactly why I meant. I'm not sure I want people to walk on my projects and I cannot see them. In all social networks, visibility is a (little) guarantee that things go not too bad. Indeed something that would be technically possible is to be invisible in the General Chatroom and also maybe invisible in your friends contact list. Maybe show in offline mode in lounge and contacts but show as normal in project. I get this request, if ya have stuff to do sometime there may not be time to be social. People can misinterpret this as rudeness when its just someone is busy in rl and on ohm at same time. But if someone is in your project it should show them, maybe with a red light or other colour light showing busy. Completly agree Dear Andy. Is what I want! I don't want either people to walk on my projects and I cannot see them.It's not my intention to be rude of course. I work 100% to picture and would love to have an uploadable picture option. This would also allow for sound FX, and bring a whole new world of music & sound people to your project. Right now, I'm working on a feature film & the sound guy (location sound, foley, sound design etc) is 2000km away. It would be great to put the project online & collaborate with him. And there are a million other just like me out there. Pictures please. Hi and THANKS. When a project is saved can it be saved with the chat window closed. Then it loads exactly as saved? I'm just going to make a simple, but useful request. Would like to have the arrow keys on our keyboards be used to go forward and backward a bar. And maybe the < and > keys go forward and backward 8 bars (so we can jump through the song quicker). 2. Please make the AUX output on any other AUX, not only master. 3. in place external audio editor: for any any audio part, open the corresponding audio file in your favorite audio editor to achieve advanced offline and destructive processing. Thanks Ohmies for this nice software ! It really could do with a built-in reverb plug-in. What would make it a unique and versatile tool for Ohm Studio is the ability to load an impulse response and have it saved with the project, so anyone opening the project is guaranteed to get the same reverb sound. Some more standard instrument plugins would be really useful too - a simple sample player loaded with General MIDI sounds would be a great start. Great work so far though. To do that it's recommanded to rather use the modular routing, actually. Ableton Live actually lets me drop to 14 o.O Lowest possible under OS X for this interface iirc. Even Studio One lets me hit 32.